Alan, what's the bit highlighted in the red? That is the needle valve for fine tuning CO2 output with a 2 in 1 bubble counter/check valve sticking up from it. I was led here by a few of your members and am happy to answer questions (we have been approached by many directly, which is fine). I will try and put all the information up here to help you arrive at a solution that will work best for you. We manufacture industrial solenoid valves in Brisbane Australia and although mainly sell wholesale to industrial applications we are happy to supply our valves if they suit your needs. We were tracked down by a lovely lady with this application some years back and arrived at using our B55-2-3-1V valve. This valve has a forged brass body with 1/4" BSP ports, a 3mm orrifice (this is the size of the jet internally that the media will flow through when the valve is energized) and a viton seat. They are available in all voltages but we have mainly sold 240v AC to your applications as it looks like you are running them from a normal wall socket. This particular valve will do up to 10 BAR in pressure which is 147 psi. As it is down stream of your regulator you should be able to set the inlet pressure. I have put a link to the valve here if you wish to view it. There is also a video if you want to see how it works and compare to others you may be looking at. The two main issues highlighted by your users are heat and noise. Some solenoid valves can have a hum, especially in AC, this is caused by the alternating current (when the sign wave collapses). Might be a bit technical but the end result is that this valve is quiet, noise is not really an issue in industry but in your application it is. Best going off existing users accounts here as I believe they have them in their living rooms. It is a point to note if buying another brand. In terms of heat this solenoid valve is good at dissapating it as the coil has a fairly large surface area and it needs about 12 watts to operate. One question we get asked fairly regularly is will the heat be lower if I go for a lower voltage? The answer is you wont notice the difference as it has more to do with the wattage of the coil and the number of windings (technical again) than the amount of amps required. So if you have 240v AC available you can save yourself the cost of a transformer and just use what you have. If you are looking to use another brand of solenoid valve try to get a viton seat on the bottom of the armature. We originally went with teflon which is fine chemically with Co2 but it is quite hard and let small amounts weap through when not powered on. You also want to make sure the coil is continuosly rated (should be 100% duty rated) as this means the valve can operate 24/7 and not fail. There are a heap of other features which make a quality solenoid valve but if you get the above two points and a valve that can handle the pressure you will be along way there. You also want an IP rating of 65 or above for your coil/din plug. From what we have seen the thread on your regulator is male NPT and our thread is female BSP. You will need an adaptor to breach the two. We have some of these at our counter due to the number of people asking when they are in here (there seems to be a lot of fish tank users out there) but you can get them from any good plumbing or gas store. I think they are somewhere between $5 and $10. You should use a licenced electrician to wire your valve up (we have one here but the charge is $45 for a 1.5m length) but some people do this themselves. If you want to see a video to see how the wiring is done there is a video tutorial here. I hope that wasnt too long winded and am happy to answer any questions. [QUOTE=Rebel;489916]Alan, what's the bit highlighted in the red? About 6 months ago I talked to Scott Christie over at process systems, one of the most helpful people I have spoken with. Having owned the B55 valve already, Scott recommended I try a new one which wasn't available when I bought the B55, and this is the B25-2-2-1VM. Brilliant valve, much improved from the B55 with a manual bypass of the electronics available, and the heatsinking options are far better with the large flat base instead of the thinner one that the B55 has! Slightly more expensive than the B55 but well worth it IMO. Alan, thanks! I thought it was optional! I was looking at a Fabco and probably keep looking depending on whether I run into trouble. I was planning to control it with the regulator but I am guessing you have them both with the reg doing the heavy lifting and the little NV doing the minor tweaks?? Whoa, the plot thickens! I almost ordered the other but will look into this one. Thanks for the tip and I think we could probably do a writeup for ultimate Ozzie solenoid so that we can promote this brand. The speed of customer service (for a minority low quantity) customer is unprecedented and so rare these days!! You will need your needle valve to control you bubble count, i don't think the regulator is capable to doing that (in terms of bubbles per second). 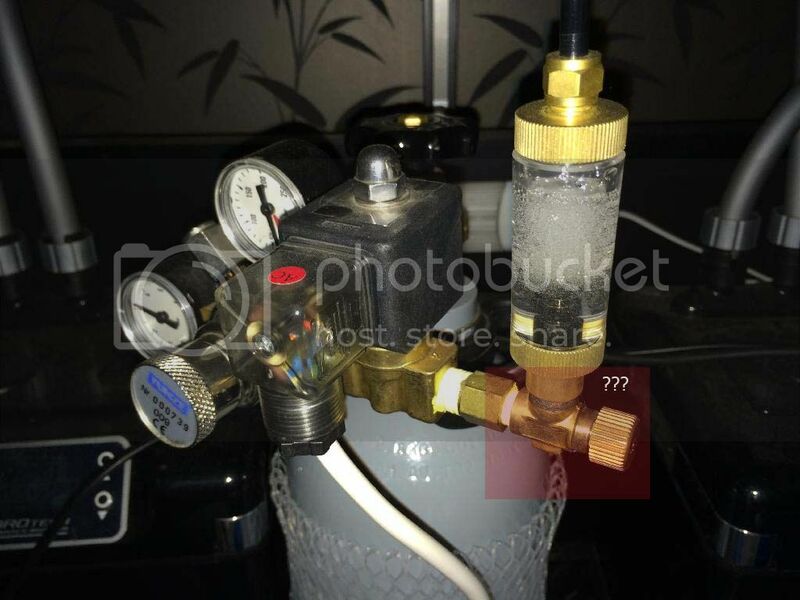 Ill be interested to see if it will work without needle valve, assuming its connected inline to bubble counter and using your regulator to adjust bubble count??? You will never be able to run a regulator this way, none of the ones anyone is using now days is actually designed for the extremely low flows we have. Regulators regulate pressure not flow. Flow must be controlled with a needle valve. I am looking into a Parker Instruments 8310, which are designed for extremely low flow rates. Unfortunately the calculations were making me sweat and the Parker guy in the USA suddenly stopped answering my emails. Maybe he had a gut full as well. I'll call the poor guy tomorrow. Correct me if I'm wrong... but it seems like the new regulator from Tunze.... 7077/3 has an inbuilt needle valve already? Component "L" (they call it fine adjustment valve) seems like a needle valve? Seems like the old one didn't have it? Or am I mistaken here? Interesting, it does have needle valve at L and a controller/metering valve at H and no solenoids. Yes the no-solenoid is both a benefit and an annoyance. At least you don't have to replace the whole thing if one component fails. I have been told that the solenoid is the weakest link in the system. I didn't know about the needle valve being built in.... Their PDF can't be zoomed without blurring of the picture! The 7077/3 has a needle valve. Hiya, many thanks for this detailed explanation which gives an insight into the solenoid technology itself. This type of information, was not forthcoming, despite my various searches through the net. Hopefully we will have your answer archived here for anyone else asking about putting together an awesome 'Australian' CO2 system (with German parts of course). Thanks again for your prompt (rather unbelievably fast!) and detailed reply. Just for interest, does the valve consume 12W only when it's open? Finally, does the B25-2-2-1VM compare favourably compared to the B55-2-3-1V. I suspect the latter, at least on paper, sounds better although the former seems to have a mechanical override, which I will probably never use. Which begs the question: The solenoid will be after the needle valve using this regulator. On the bright side you won't have to buy one! Just wondering whether that "metering valve" is a good idea then. Maybe stop inrushes of gas or funny business when the solenoid opens first thing everyday?